The Mirabella 10430 Wilshire Blvd are condominiums located on the South Side of The Wilshire Corridor. The Los Angeles luxury Condominiums are large spacious units that are over 2000 square feet. The building was designed by Maxwell Starkman Associates and was built in 1982. It’s multi-faceted exterior has large windows that fill the units with light. There are 114 units and the building is 22 stories tall. The Mirabella 10430 Wilshire Blvd has three bedroom units, something not all buildings can boast. It is a full service building with valet, concierge, party conference room, pool, and gym. The units average 1 million to 3 million. Southern exposures face Century City and can stretch towards the West with ocean views in the distance. The Mirabella is close to Century City and Beverly Hills. You can walk to many places of worship, and Holmby Park. The Mirabella is close to UCLA and all the shops in Westwood Village and along Westwood Blvd. Living on the Wilshire Corridor enables you to be in a great central location in Los Angeles. 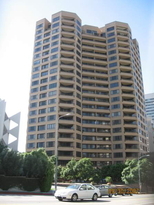 Condominiums are for sale and for lease in The Mirabella 10430 Wilshire Blvd. Fairburn Ave Elementary school is the public school available to residents.